1976 Festival of American Folklife, Working Americans program (FAF1976_0791). Photo by Richard Chu. Courtesy of the Ralph Rinzler Folklife Archives and Collections, Smithsonian Institution. The Working Americans program explored and celebrated work-related traditions, looking at Americans not as people from a certain area of the country or from a particular culture, but in terms of how they made their living and what they needed to know to do their jobs. Each occupation has its own traditions and its own body of skills. 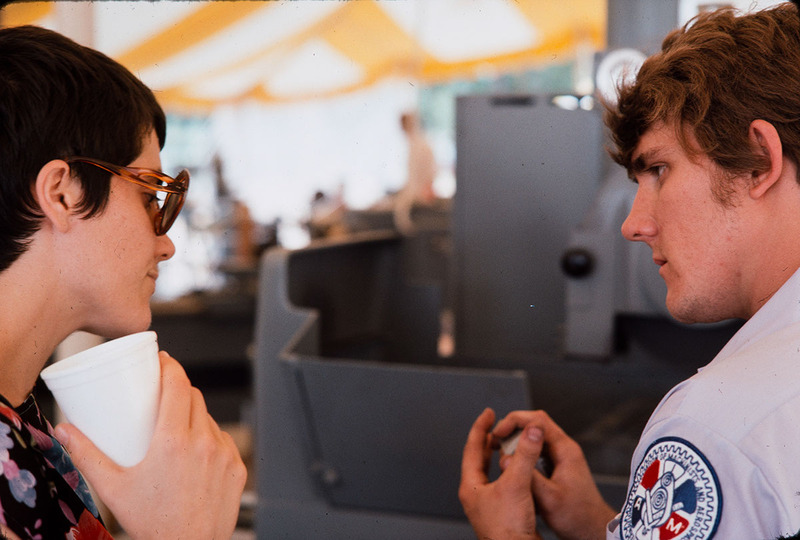 In the Working Americans section, Festival-goers could meet and talk with members of many unions and organizations while they demonstrated the particular know-how essential to their varied tasks and while they shared, in the workshop areas, the particular tales and jokes that grow out of the nature of the work they do. The Folklife of Transportation Workers Project celebrated the lore, lifestyles, and occupational skills of the American workers who operate, maintain, and regulate the nation's transport system. The airline pilot's complex take-off procedure, the flight attendant's responsibility for safety in the cabin, the railroader's ability to calculate and make complicated box-car switches could be found here; as well as bus and taxi drivers' tales of ways to handle over-demanding passengers, truck driving songs, and seafarers' yarns. Transportation workers keep the nation's economic lifeblood moving. They also harbor a rich lore, replete with heroes, tall tales, and songs, that was demonstrated within this program. June 16-27, Workers Who Extract and Shape. Presentations included glass bottle blowing, glass engraving and horseshoe making. July 1-11, Workers Who Build. This program celebrated the skills and folklore of the building and construction trades. Participants demonstrated building crafts such as carpentry, tile and terrazzo skills, and even the casting of plaster masks of visitors' faces. July 14-25, Workers Who Clothe Us. Participants celebrated the skills and folklore of workers in the garment trades, with demonstrations of clothes design, bonnaz (machine embroidery), leather work, and industrial loom work. July 28-August 8, Workers in Communications, Arts & Recreation. This theme celebrated the skills and folklore of the print and broadcast media, telephone communications, and performing arts. Members of the Graphic Arts International Union demonstrated newspaper printing, four-color printing, and book binding. Members of the United Paperworkers International Union demonstrated papermaking, and members of various performing arts groups gave workshops. August 11-22, Workers in Professional & Technical Skills, Transportation. Presentations celebrated the skills and folklore of professionals who work in health and medical fields, the tobacco industry, and the print and copying industry. Demonstrations included hospital workers demonstrating operating room techniques, cigar rolling, pharmacists making compounds, and body repairmen working on cars. The Transportation area presented the occupational culture of the men and women who work in the various modes of transportation, including the railroads, metropolitan and long-distance buses, taxicabs, trucks, ships, and stations of the Coast Guard. In the Transportation area, the skills of railroad men, airline pilots, truck drivers and seamen were featured. August 25-September 6, Workers Who Feed Us, Transportation. Participants celebrates the skills and folklore of people involved with various aspects of production, preparation, and distribution of food. Hotel and restaurant workers demonstrated decorative ice carving, specialty table settings, wine stewarding, and cold food decoration. The Transportation area presented the occupational culture of those who work in the various modes of transportation, including skills demonstrations by airline, railroad and metropolitan transit workers, as well as by Coast Guardsmen who showed ornamental rope work and knot tying. Shirley Askew served as Program Coordinator, with Robert McCarl as Folklorist, Robert Porter as Field Research & Presentation Specialist, and Susan Donahue as Assistant Program Coordinator. Peter Seitel was Project Coordinator for the Transportation program, assisted by Jack Santino. Sponsors included the AFL-CIO and its Affiliates, U.S. Department of Labor, and U.S. Department of Transportation.